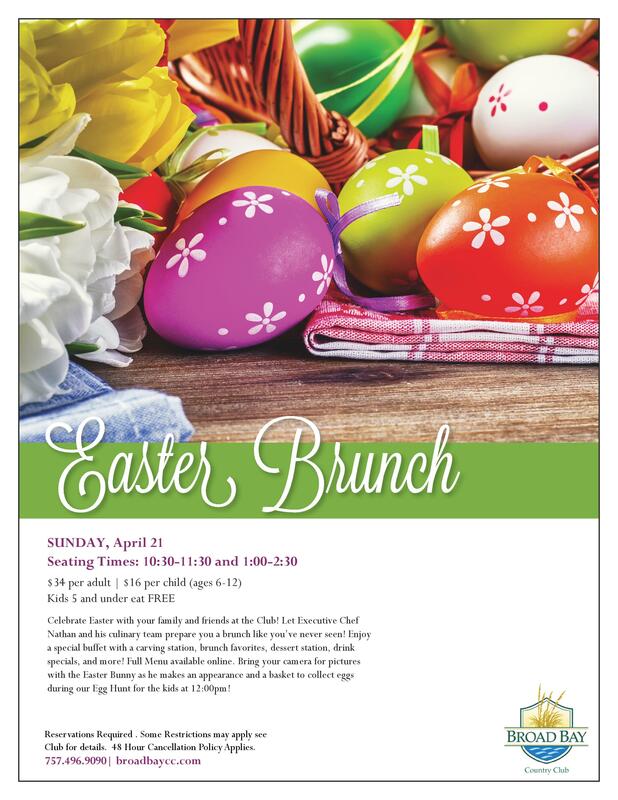 Broad Bay will be hosting a lovely buffet for Easter, along with an Easter Egg Hunt and a visit from the Easter Bunny. Reservations are now open for seatings from 10:30am to 12pm during seating number 1 and 1pm to 2:30pm during seating number 2. The Easter Egg Hunt is scheduled for 12pm to accommodate both seatings. The cost of this event is only $34 per adult and $16 for children ages 6 to 12, kids ages 5 and under eat free. Make your reservations now by calling (757) 496-9090 or emailing bcornell@broadbaycc.com.